shakes off it with ease, and it packs right up in a jiffy. beach. You can also use the pockets for personal items. like electronics or sunscreen! your next beach vacation is a no-brainer! mildew-resistant. No more wet towel odor! Thank you for choosing Kimfly! ❤WATERPROOF & SAND FREE. Sand, water, dirt & dust will disappear before your eyes, it's easy to sweep the sand off, easily cleaned and dries instantly. The blanket has corner pockets you can fill with up with sand or stones to keep it to the ground (windproof), also be used to store your personal items. ❤IDEAL SIZE 55″ x 67″ . The perfect size for your travels and the outdoors. It was designed to fit 2 persons comfortably, but it can fit up to 4 persons. A perfect present for yourself, or friends! ❤MULTIPLE USES: Our beach blanket / camping blanket, it is the perfect choice for the park, the beach, sporting events, soccer games, tailgates, concerts, hiking, outdoor sports essential products. ❤CUSTOMER GUARANTEE. 100% Money-Back Guarantee, no questions asked! We are confident you'll love our Blanket. Beacuse customer satisfaction is our top priority. View More In Picnic Basket Accessories. 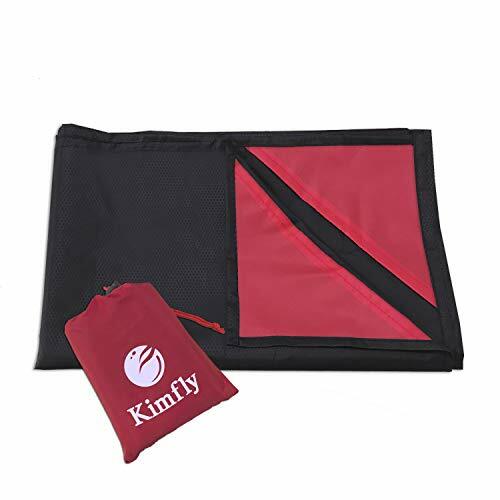 If you have any questions about this product by Kimfly, contact us by completing and submitting the form below. If you are looking for a specif part number, please include it with your message. Collapsible Pop-up Mesh Food Covers Set & Inflatable Picnic Buffet Server - Tabletop Cooler and mesh Net Covers Are the Perfect Solution for Outdoor Parties! Picnic Mat MiluoTech Foldable Large Picnic Blanket Waterproof Camping Mat for Outdoor Beach Hiking Grass Travelling - 60" x 78"